In preparation for the big Lancelot extension for Albion Online, the developers of Sandbox Interactive reveal more details. The Lancelot update will be released on March 12 for the MMORPG Albion Online. 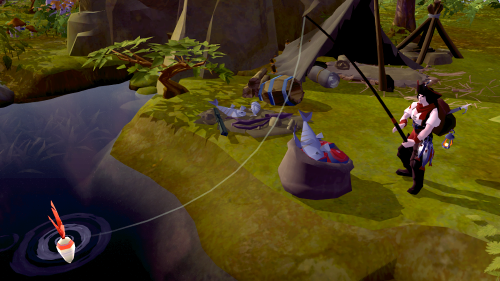 Among other things, it introduces a fishing system that you can fish with. On the one hand, the fishing system is a new activity with which players get something new to do. In addition, it is integrated into the economic system of Albion and offers the opportunity to make far-reaching economic decisions. Similarly, the developers want to introduce a simple feature that can be easily done by anyone but also offers a certain depth. The fishing system will be completed with a special Angler's Path on the Destiny Board and a fishing journal for your homes and will continue to give you the opportunity to craft trophies from slain bossfish. In a new developer video game director Robin Henkys introduces you to the Angel system from Albion Online. A new activity that is fun and accessible to all players. The integration into the economic system of Albion with the possibility to make interesting economic choices. A relatively simple feature, but still has depth. So there is a special fishing gear on the Destiny Board, a fishing journal for the players' home and players can craft trophies from killed boss fish. More about Albion Online can be found on our topic page.